Descended from a Devonshire family, Edward Tucker was born in London c1816, his father being a barrister. ​from his early days as a painter. He married Julia Mary Maile, a fellow artist and they had five sons, all of whom were taught to paint by their parents. In order not to be confused with their father, three of them were known by other names. Because of this confusion many art websites vary in the dates of Edward Senior’s birth and death but census returns and obituary notices are more reliable. According to Arthur P Shepherd, Alfred Maile’s biographer, "the boys all worked together in one large studio under the criticism of their parents and the frank comments of one another, and their artistic talents developed rapidly”. As their parents didn’t have enough income the family moved from place to place in order to make a living. Around 1865 Edward Senior took up residence in the Lake District, living in Langdale for many years before moving to Windermere, where he became known as the “Artist of Windermere”. Four of his sons were founder members of the Lake Artists Society and Hubert was its first President. Alfred had joined the church, became a Canon of Durham Cathedral and later Bishop of Uganda. Edward worked mainly in watercolours and several of his paintings were hung in the Royal Academy. Art historians are frequently unsure which paintings should be attributed to father and which to son. There is an oil painting attributed to Edward Tucker in Dartmouth Museum labelled Dartmouth Harbour from Castle Walk, Devon 1835. This was purchased by The Friends of Dartmouth Borough Museum for £240 from a London gallery in 1963. The chairman of Dartmouth Museum, Commander David Lingard, informed us that there is some doubt over the artist’s name and date as, according to one of their members, the artist was Edwin Tucker. St John’s Church, Bowness in Windermere, which he had attended. 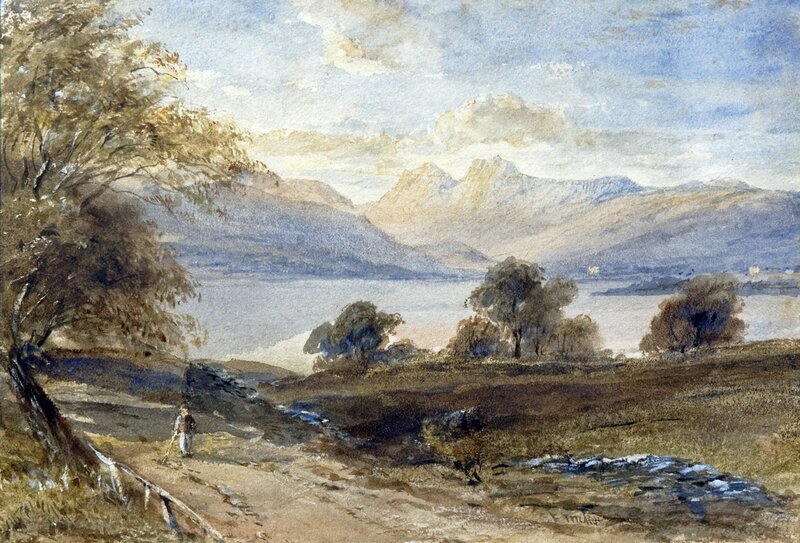 Originally entitled “Coniston, near Brantwood 188?”, it is now thought to be the Langdale Pikes, as several viewers had pointed out that it definitely was not the Old Man of Coniston. Dr Ian Milner, a retired local GP familiar with the Lake District setting, has suggested the hills rising majestically in the background are most likely the crags of Langdale Pikes with Pavey Arc to the right.